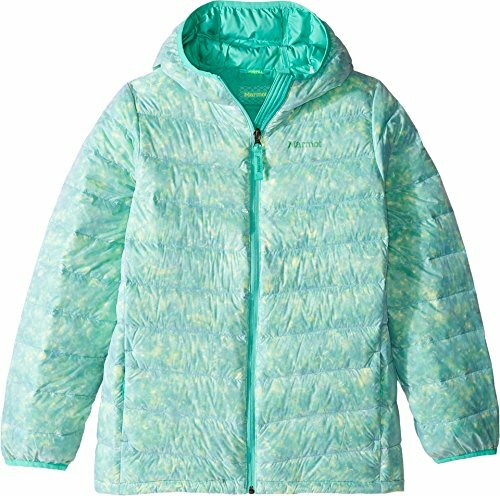 Marmot Kids Size Chart Whether it's the Rockies, the Alps, or the top of the snow pile in the backyard, she's ready for the outdoors in the insulative Nika Hoodie. Regular fit is eased, but not sloppy, and perfect for any activity. 700-fill goose down with Down Defender:• Stays drier 10X longer and dries 30% faster than untreated down.• Maintains 150% more loft in damp conditions.• bluesign® approved. Fixed hood extends protection. Full-zip front closure with interior wind flap. Angel-Wing Movement™ allows arms full range of motion. Welt hand warmer pockets. Straight hemline. 100% nylon.Lining: 100% polyester.Insulation: 700-fill-power goose down. Machine wash, tumble dry. Imported. Measurements: Length: 25 in Product measurements were taken using size XL (14/16 Big Kids). Please note that measurements may vary by size. Whether it's the Rockies, the Alps, or the top of the snow pile in the backyard, she's ready for the outdoors in the insulative Nika Hoodie. 700-fill goose down with Down Defender:• Stays drier 10X longer and dries 30% faster than untreated down.• Maintains 150% more loft in damp conditions.• bluesign® approved. Fixed hood extends protection. Full-zip front closure with interior wind flap. Angel-Wing Movement™ allows arms full range of motion. Welt hand warmer pockets. Straight hemline. 100% nylon.Lining: 100% polyester.Insulation: 700-fill-power goose down. Machine wash, tumble dry. Imported. Measurements: Length: 25 in Product measurements were taken using size XL (14/16 Big Kids). Please note that measurements may vary by size. If you have any questions about this product by Marmot, contact us by completing and submitting the form below. If you are looking for a specif part number, please include it with your message.